We first encountered this plant while we were hiking through the Armand Bayou Nature Center, finding answers for an Earthcache out there. I was fascinated with the unique color of the leaves and the soft, rounded seed capsules beneath them. (Actually, I think I remarked that to me, they bore a resemblance to monkey nuts, but that is just the demented primatologist in me). In this picture, you can also see a worm moving along the petals, which also intrigued me that day. This first encounter back in September, we took pictures in hope that we can use them to identify it later. Only, I couldn’t figure out how best to do that. A few weeks later, we were at an outdoors expo at Discovery Green, and I talked to a TPWD employee about their recommendations on free online field guides to identify plants. 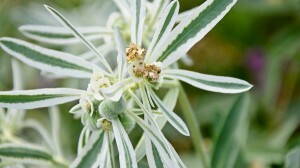 The lady referred me to the Lady Bird Johnson Wildflower Center’s online field guide, which is awesome. However, it is somewhat difficult to use when you want to do what I was trying to do, which was match the picture up with another one that had a name attached to it. Another month or two later, we were out for a lunchtime walk at the Shadow Creek Ranch Nature Park, and I thought I saw a picture of the plant etched into an interpretative sign. I couldn’t be sure though, because there was no color on the sign and the etching was not a perfect replication. Also, I meant to remember the name of the plant on the sign that resembled it and look it up later, but I forgot the name I had seen. Around Christmastime, we were flipping through field guides of plants at bookstores and couldn’t figure out what book would be best to buy to find information like this. Then, last night, we were at Katy Budget Books and found a pamphlet with color pictures called “Texas Trees and Wildflowers”. I told him, “this is just what I need!”, then went on to browse the other nature books. Then he pointed to a picture on the pamphlet and said, “There it is”. On December 29, 2004, elephants in Sri Lanka giving rides to tourists began trumpeting and acting agitated. Chains were broken, and the beasts ran for the hills. They weren’t the only ones acting peculiar that day. In nearby Yala National Park, monkeys and birds had been acting odd all day, turning their noses up at bananas offered to them. Three elephants were seen fleeing uphill. Flamingos fled breeding grounds in Thailand, and in India a lighthouse looker observed a herd of antelope stampeding for the slopes. Most of the animals began a mass exodus to points north, seemingly fleeing from something nobody really understand. Until about an hour later, when the Asian Tsumani hit, the worst tsumani in history. The death toll in all the affected areas hangs around 187, 000 people. However, in Sri Lanka, where these elephants hailed from, there were 0 reported animal deaths, compared with 30,000 human deaths. No animal carcasses were found in Yala National Park, and all the tourist elephants and all the 250 wild elephants living in the park survived. Some want to hail this as proof of a “sixth sense” of animals, or that the animals have some kind of deeper connection to the natural world. Others want to disprove it somehow or call it urban legend. 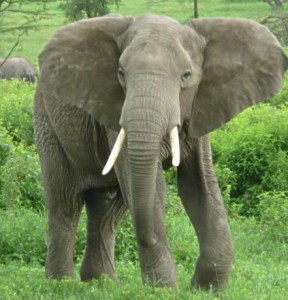 I think it is possible that the elephants more sensitive hearing and ability to detect infrasound gave them a heads up that danger was coming, and their survival instinct led them to advance to higher ground. Or perhaps they were able to feel the vibrations of the approaching storm through their feet. Many animals, including humans, are designed to feel vibrations in the earth (we are equipped with special receptors called “pacinian curpuscles” for just this purpose), but most of the time, humans tune this information out. There are two facets that intrigue me about the behavior of the animals before the storm. Scientists studying the elephants at Yala say their radio collared elephants were acting normally before and after the storm (http://nationalzoo.si.edu/Publications/ScientificPublications/pdfs/41A3412A-04F5-48D1-86A7-8BF03813F28B.pdf) , and that their behavior was normal in response to environmental cues. 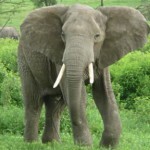 The scientists are trying to disprove the theory that the animals were acting in a way akin to a “sixth sense”, but yet a Google search about the elephants behavior lists all stories about this alleged sixth sense, and only one tag to the scientific paper about these radio collared elephant. It makes me wonder about media and perception and what people would rather believe. The other interesting aspect is how humans have processed this information. Since the incident and these widespread stories, using animal behavior as an “early warning signal” of approaching weather disasters is being looked into by governments, research institutions, and other interested parties. Expect to see more information in the future on animals being used as sensors predicting natural disasters in the future. Posted on January 2, 2011 May 2, 2014 Categories Animal Behavior1 Comment on Did Someone Say “Tsunami”? After flipping through a birding field guide we got for a family member, one of us had some present envy and/or technology curiousity, and discovered an app for smartphones called iBirdPro. The advantage of this app over a field guide is that in addtion to pictures and information about the birds, the app plays their calls as well. This day, the same one of us was playing with our four dogs out in a neighboring field, where we often see some bird action. When the dogs jumped out of the truck, they startled a hawk. The hawk flew to the other side of the field, stopped for a moment, then flew overhead, calling, and headed south. 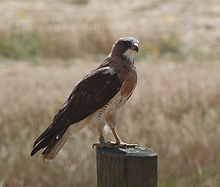 Using the iBirdPro app, the hawk was able to be identified as a Swainson’s Hawk. A bit of research later yielded some interesting information about this hawk. Being that it is winter in Texas, and these birds usually spend the winter in South America, it is suspected that this particular hawk might have missed the party, and the flight path, and was unable to find its way south of the Gulf of Mexico. This particular species was blue -listed (at risk, but not endangered or threatened) in the late seventies and early eighties, and made it on to the National Audubon’s List of Special Concern in 1986. Currently, it is listed as a threatened species by California, but numbers elsewhere suggest the bird is more abundant than previously thought. The National Audubon Society uses their Christmas Bird Counts as a way to keep track of what species are thriving and which ones are declining. The Christmas Bird Counts run from Dec 14-Jan 5. You have to become a member and pay a small fee to participate, but learning how to identify the birds is a first step in being able to participate in this activity. Here is the website of the Audubon Society to learn more information.